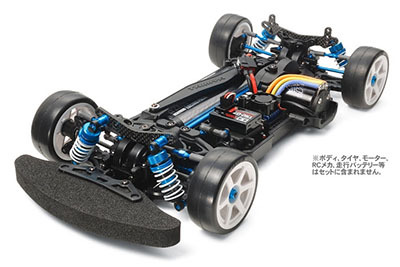 The TB-04 PRO II chassis further refines the efficient shaft driven 4WD and excellent handling of the TB-04 PRO. Front and rear suspension arms and uprights now take the same form as those on the high-end TRF418 chassis, allowing swift rebound stroke adjustment via 2mm hex wrench, plus smoother cornering. Front and rear universal shafts allow for efficient power transmission, combined with TRF short dampers plus front and rear gear differential units. Hex screws offer secure attachment and enhanced maintenance.